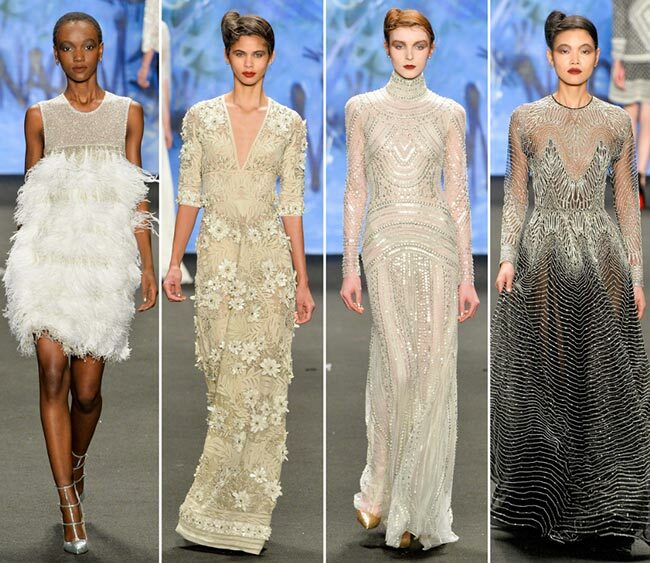 The year’s biggest fashion trends appeared on the Naeem Khan fall/winter 2015-2016 collection runway show, from extremely high slits up the thighs to the slits up the middle, from the low plunging necklines coming down to under the bust to the higher necklines that covered up the skin on the chest with sheerer fabrics; we had capes and lace, bodysuits and incredible gowns that could be made of moonbeams themselves. It was an incredible sight unto itself, with lots of embroidery, sequins, shiny fabrics and floating garments. It was like a dream manifesting into reality on the runway in such a lovely fashion that we had our eyes glued to the models presenting the pieces by the Indian-American fashion designer based in New York. The 56-year-old fashion genius comes from Cumbala Hill in Mumbai, India. Launching his eponymous line in 2003, Khan soon became a well-loved creative mind who would end up designing for major celebrities like Diane Kruger, Eva Longoria, Carrie underwood, Beyoncé, and Brooke Shields, while also laying claim to First Lady Michelle Obama’s “Priceless’ first state dinner dress. Against a backdrop of beautifully painted graffiti, the night sky came to life with the first piece on the runway being a spectacular gown of glittering gold on black tulle, complete with a gold studded belt and studded pleating that gave the red carpet worthy number such an alluring appeal. It was a very good choice to open with and even better when we realized the gold and black would become a recurring theme among the collection. We especially fell in love with the gold-thread embroidered designs on the tights worn by the models that would appear later, a concept that really does have its special pull on a woman’s attention. The legs are, after all, one of her finest assets and showing them off in something more than a simple black pair would certainly be ideal. This always seems the case with those who come from the Middle East or from the Eastern countries in general: there is a lot of embroidery and much to be inspired by when taking a look at ethnic traditional handiwork on clothing. 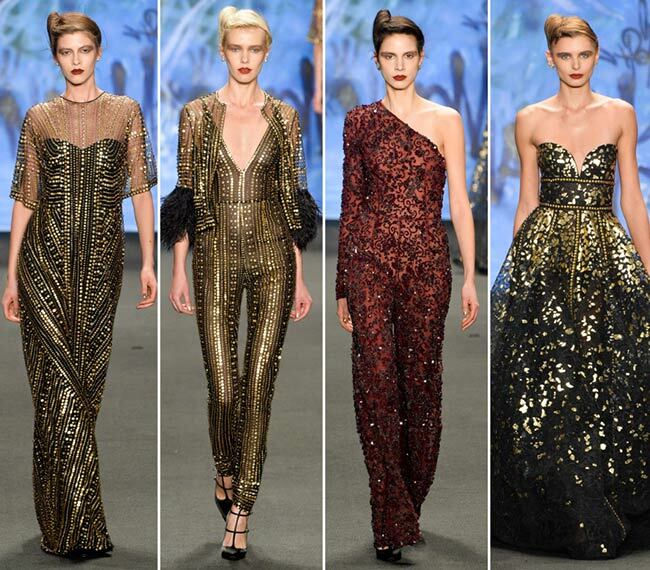 From the single shoulder jumpsuits to the star-studded full length dresses, the swishing lightweight fabrics in silks and satin to the heavier brocades that engulfed the female form, Naeem Khan definitely had quite a feat prepared for those starving for more fashion. The handiwork had a very distinctive south-eastern charm and the Indian flavour was very much apparent in each painstakingly perfected piece of embroidery. We even saw some floral looks that appeared on strapless high-necked sheath dresses and even on rights worn under coral hued feathery pieces. 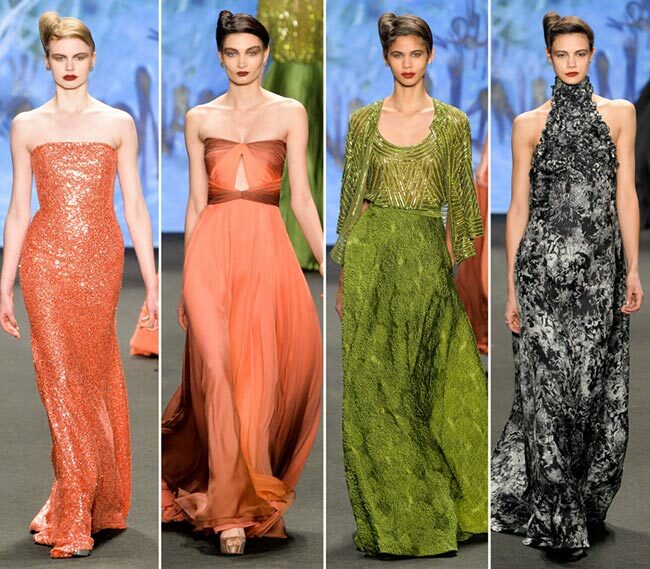 Corals, reds, greens, black and gold all remind us of the kaleidoscope of colors that create the world of Bollywood. The golden strappy stiletto heed shoes also caught our attention as we watched the models glide down the catwalk. They weren’t the only footwear in sight by any means though. The black versions also appeared, as well as ankle boots in gold and black, alongside strappy sandals in black satin and a golden shine. 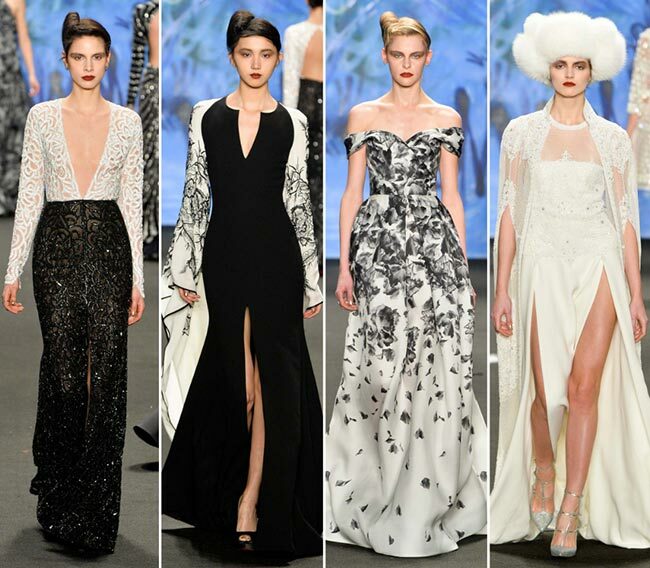 Perhaps the most enchanting of the Naeem Khan fall/winter 2015-2016 collection were the last few pieces that incorporated both black and white, a trend common to the runways this season, in beautifully ornate embroidery, color blocks, or sequinned designs that somehow brought the night sky onto the cascading fabrics of the gowns brought out for the world to enjoy, each one more breathtaking than the last. 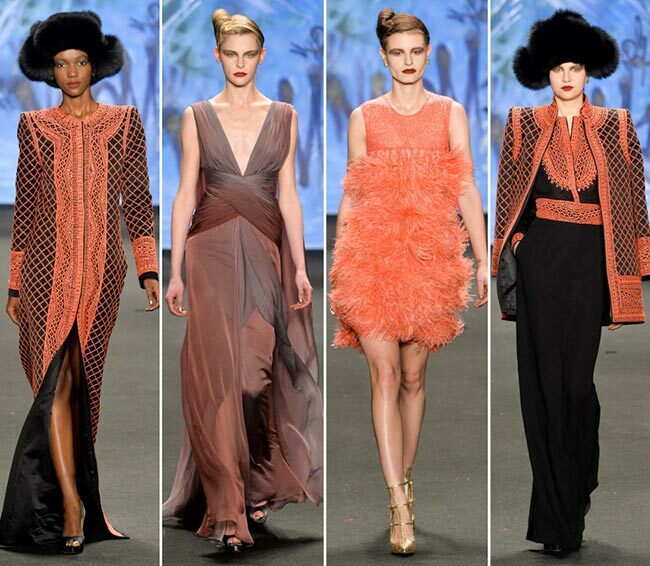 All in all, one of the best shows on the runway yet!